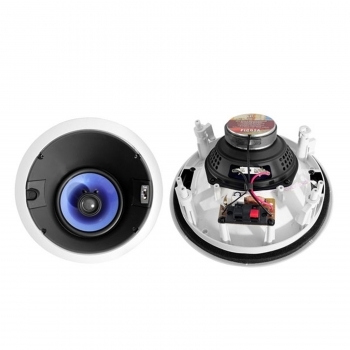 These Pyle in-ceiling speakers are directional for a focused sound experience - deliver high performance audio with focus for your home or business. This pair of 6.5", 250-watt speakers features a 5" polypropylene cone full range mid-bass speaker and a pivoting 1" voice coil silk dome tweeter for a full sound with a particularly sweet high end. Tweak your sound using the built-in treble controls. These speakers ultimately deliver a frequency response of 45 Hz to 20 kHz. Includes built-in mounting hardware for easy installation.